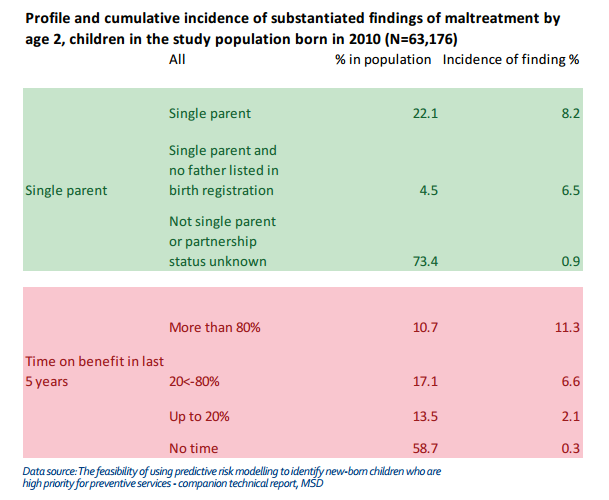 It is not being on welfare per se that is responsible for a ‘caregiver’ being 38 times more likely to abuse a child, rather it is the personal dysfunction that has led to solo parenting and a life of welfare dependency. In other words, I doubt that welfare itself is causative, although having the State pay young women to have babies is somewhat unhelpful, I suspect it is the personal and family dysfunction surrounding that ‘caregiver’ that precipitates the abuse. Therefore, removing welfare completely from everyone as some people advocate, is unlikely to prompt a significant reduction in the levels of child abuse. A better response would be to signal the end of welfare support for new teen mothers, or those women who have never been in a relationship in the form of marriage. This would have the effect of eventually reducing the number of young women entering solo parenting, and thereby reduce the incidence of child abuse. Restricting welfare support to those women and their children who have been abused or abandoned by their partners would take the legislation back to its original intent. I’m not sure there are enough votes in this to prompt a National government to act, or to endure the personal vitriol from the left that such an action would prompt. I suspect it would take political action by those doctors and health professionals whose daily job it is to treat the child victims. Even then I doubt there would be consensus amongst them as to causation. There are probably as many who think increasing benefit payments is the answer as those who believe removing financial incentives to enter the system is the solution. Therefore, the prospect of change is not high. 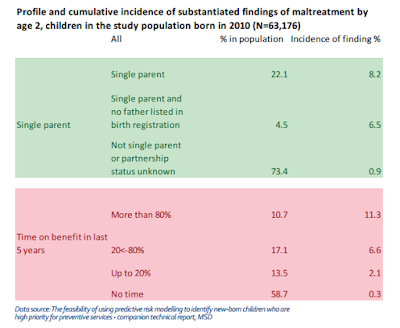 What might work (politically) is the option of a controlled study, where child care benefits were increased significantly in one region, and removed completely in another. Run the study over 10 years and then measure the results. If we don’t start thinking outside the square on this issue, nothing will change. "I doubt that welfare itself is causative." Hence my post title referring to "correlation". Support for teen mothers has been restricted. They get assistance-in-kind: are mentored and expected to meet parental obligations. And there are now far fewer teen parents than there were in 2008. Again this relationship may not be a causative one though. "Restricting welfare support to those women and their children who have been abused or abandoned by their partners would take the legislation back to its original intent." Original included allowing single mothers to not work and stay home with their children - to avoid having'latch-key kids'. It is a myth that the DPB was just about supporting abused and abandoned mothers. Feminists were working to make the state liberate women from dependence on men. "What might work (politically) is the option of a controlled study, where child care benefits were increased significantly in one region, and removed completely in another. Run the study over 10 years and then measure the results." The government can't even agree to conducting predictive risk modelling due to a misconception that some children would have been guinea pigs. So I don't hold out much hold for your idea Brendan. Bill English has steered much of the reformed 'social investment' actuarial approach which has promise. Will be happy to see him continue on or assume more power...in light of any other party alternatives. I must be getting old.. increasingly it seems to me that in a free society you can't stop people from doing what they want to do.. or what they can get away with. Activists and people who genuinely care about child abuse can rant all they like but they won't stop neglect and abuse without specific oversight and control of suspects or groups. Thanks to Bill English and his team we've made very good progress in identification of at risk groups .. next step is a muscular Plunket type organisation that is able to monitor and train or remove as needed. The hard part of course is setting up such an organisation in the face of the screaming perpetrators, activists, interest groups etc who have a financial and emotional interest in perpetuating the problem. I think that an expectation of winning a war is foolish unless you are prepared to name the enemy but we dare not do that because to do so would be ..... (name the progressive poster group of the day and put phobic, ist or ism at the end).